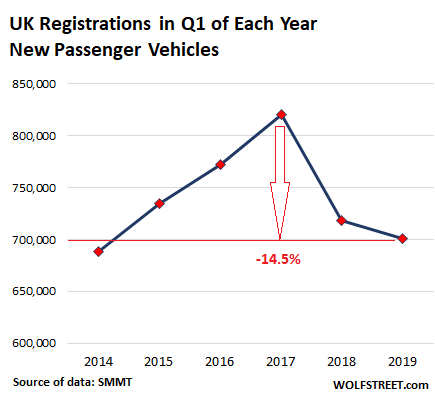 Sales of new passenger vehicles, as measured by registrations, fell 3.4% in March from a year earlier in the UK, the second largest auto market in Europe, as consumers shunned showrooms during what’s usually a bumper month for sales due to a number plate changeover, according to the the Society of Motor Manufacturers and Traders (SMMT). Total sales in March of 458,054 vehicles was the worst performance in March since 2013. With the UK government and parliament having descended into a state of virtually unprecedented chaos and raw sewage reportedly leaking through the roof of the chamber of the House of Commons, the chances of that happening in the next two or three days are tiny. But Hawes can nonetheless rest assured that the political establishment on both sides of the English Channel will work tirelessly to ensure that the threat of a “no-deal” Brexit is neutralized by next Friday, when the latest Brexit deadline expires. The UK is the second largest auto market in the EU, behind Germany. It is also the largest single export market for German automakers, which sold 800,000 new cars there in 2016, or 20% of their overall global exports. Fewer cars are exported to its two biggest overseas markets, China and the US, since German automakers have factories there. In the full year of 2018 sales dropped 6.8%, which in turn followed on the heels of a 5.7% slump in sales in 2017. And in Q1 2019, the slump continued. Diesels’ share of total registrations has plunged from a 49% share in 2014 to a 27% share in Q1 2019. Gasoline vehicles continue to pick up some, though not all, of the slack, with sales rising by 5.9% in Q1 2019. There was also a 14.7% rise in sales of alternatively fueled vehicles, which include battery-electric vehicles and plug-in hybrid electric vehicles. But while their numbers are rising, their combined market share is still only around 5% of total registrations. By customer type: in Q1, sales to consumers and fleets were down by 0.8% and 0.9%, respectively. It was in the business sales category where the real pain was felt, with registrations plunging a staggering 41.4% on the first quarter of 2018. In March there were declines across almost all vehicle segments, including popular Dual Purpose (-1.8%) and small cars (-4.0%). The only exception was the supermini (small robust cars) – Britain’s favorite vehicle type – which saw a 4.3% increase in demand, and accounted for 33.7% of total registrations. Below are the best sellers in the UK for both March and the first quarter of 2019 (table via SMMT). Note that in March, nine of the ten best sellers were either small cars or superminis, the exception being the Nissan Qashqai. The March sales figures are the latest bad news for the U.K. car industry. UK car production is also falling precipitously. While there may be a temptation to pin much, if not all, of the blame on Brexit-related uncertainty, it’s worth bearing in mind that car sales have been sliding across the EU over the last six months. In Spain alone sales slumped by over 8% in February and 4% in March. But with the UK market so important for Europe’s struggling car manufacturers, both in terms of sales and production, it’s perhaps no surprise that Brussels is pulling out all the stops to prevent Europe’s second largest economy from crashing out of the EU next week. But that may not be enough to stop an accidental Brexit from occurring. And even if it is, there are still big question marks over whether a long Brexit extension will stem the sliding car sales or instead merely prolong the economic pain and uncertainty. Time will probably soon tell. By Don Quijones. – And people are blaming the Brexit for this ? By now, when people don’t have a bowel movement in the morning, Brexit gets blamed. That said, Brexit has become an incredible mess in political terms in the UK. And there are so many uncertainties, and so much discord and confusion. For companies, it’s terrible. They can prepare for a hard Brexit, but they cannot prepare for potentially years of uncertainty. So clearly, this is impacting business decisions. 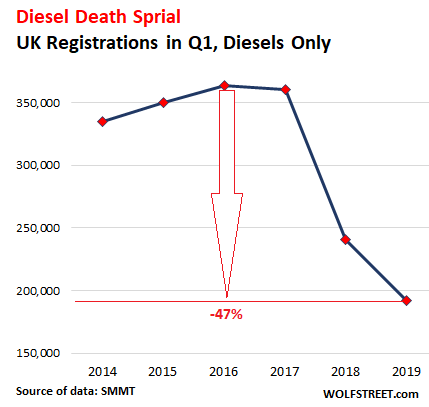 But Brexit has nothing to do with the diesel death spiral. That’s an entirely different story. Many potential diesel-buyers switched to gasoline vehicles, and a few to EVs. But some people who loved driving diesels before dieselgate suddenly felt uncertain after dieselgate and have not purchased ANYTHING. They’ve delayed their purchase decision. I’m at the point where I believe the costs of all this mis-management of Brexit and the uncertainty associated are surpassing the costs of the EU just cutting the UK loose. A bad plan executed is better than a perfect plan that never materializes. There’s no way I’d offer or approve another extension, and I’m starting to think at least one country in 27 feels the same. Came through the ceiling of the Press Gallery, apparently. Comment as they say, is superfluous. These significant declines in Registration were entirely predictable. It should not be a surprise to anyone that the UK new car bubble is finally bursting. The manufacturers and importers have kept the balls in the air for so long with 0% interest, subsidised PCP’s etc. etc. that it was inevitable that one day sales would fall of the edge of the cliff. Add the diesel confusion, the Brexit confusion, and the fact the dealers only make a very small margin at the end of the day. Boosted often by complex monthly and quarterly Registration Bonus targets. It can only end in a big decline and a reset of margin, reductions in the massive discount to priority customers (ie Driving Schools and Motability) etc.etc. Good to see you correctly referring to ‘registrations’ rather than sales – nearly 90% of these ‘sales’ are leases (ie three-year rentals). Airfields and disused racing circuits (Rockingham) all over the country are filling up with ‘PCP handbacks’ for which there are no customers, and which will only ever have been owned by a finance company – why would you buy/lease a three year old car when you can have another shiny new one after three years, with no deposit? Just sham ‘prosperity’ based on cheap credit. …exactly like 90% of the UK economy, in fact! Best hope that no-one attacks sterling after Brexit, so IRs can remain low in perpetuity. The UK is on the cusp of finding out the difference between real wealth creation (manufacturing and export) and the fake kind (imported stuff and ‘services’ bought using credit). You said this sort of thing before here. So read this carefully. Clearly you don’t understand how a lease works. A lease is a SALE by the dealer (who gets paid in full) to the leasing company. The leasing company becomes the owner of the vehicle. It then leases it to the customer. The vehicle is registered in the leasing company’s name while the customer drives it. In the future, any of your comments stating falsely that a lease doesn’t count as a new-vehicle sale will be deleted because it’s wrong, and it’s wrong in a manipulative manner, and people might actually belief this nonsense. Some would consider dual entry bookkeeping using a small fractional reserve, and counting that as payment, is a false sale and therefore manipulative and wrong, I suppose ? Bankers, that’s gibberish, as far as auto leases is concerned, or is it a joke that I don’t get? I suppose the loans are asset backed by the vehicle, but then I also suppose that the ability to buy vehicles to then lease by repeatedly using the same money (frl) to do so is not quite a true purchase, even if finance is only intermediary it is still proprietor . From the end user side it is not a purchase but a lease – in short vehicles are being built to lease not to sell from the consumer standpoint, and no more. So talk of sales depends on choice of definition, and admitedly as far as business is concerned that definition is applied to the point when a manufacturer receives payment, not the agreement the end user signs. Gibber gibber gwibble gwobble etc. A sale is a sale no matter who buys it or how it is financed or what happens to the loans or leases or whether or not they’re securitized. I still don’t get what you’re trying to say. What does “fractional reserve banking” have to do with it? And double-entry accounting is the STANDARD accounting method in the entire modern world. It is based on the principle that every transaction MUST BE recorded with at least two entries, a debit and a credit, and those debits and credits have to balance. Even my little company uses double-entry accounting. Basic accounting software uses it. It’s what you learn on day one of Accounting 101. Germany’s passenger auto sales are up 0.2% in Q1 ’19 over Q1 ’18. Further, Tesla was the best selling car in Norway last month. Interestingly… OK, the link is in German, sorry. What it says is that the share of commercial registrations rose 4.4% to 63.8% of total registrations; and the share of private registration fell 8.3%. Yes. Registrations not sales. 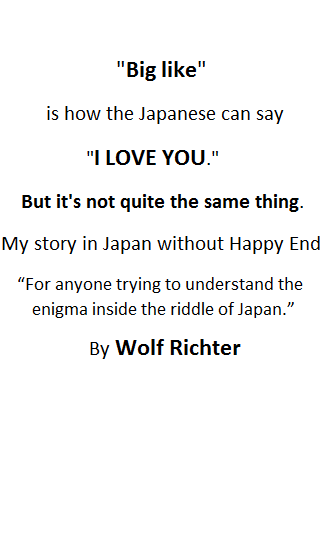 I got the information from the website below. I wanted another reference point as an adjunct to your article. The Tesla sales numbers i stumbled upon raised my eyebrows a little. That’s why i mentioned it. Norway – the country that kept over 80% of its oil for its people and used the revenue to to build a sovereign wealth fund and make its citizens the wealthiest on the planet. But it as well to recall that Norway, a newly wealthy state without a long history of urbanisation and industrialisation, was not in the same position as the UK, a declining early-industrialised state (indeed, the very first) : naturally, the oil revenue was plundered to keep the show on the road, just. The electorate wouldn’t have accepted anything else. This is probably a permanent trend for the UK. Brexit ( when it finally happens) will probably drive the last nail in the coffin of the City of London Financial Racket which kept the UK consumer economy afloat. With North Sea Oil depleted, and the Island’s manufacturing economy shrunken to a husk there will not be much left to for people to pay for cars and fuel. It will slowly be back to the Britain of the 1950’s with bikes and push carts for the masses instead of cars. The City of London is a separate country in it’s own right, it benefits a small amount of privaleged people. The only time it becomes a UK issue is when it needs a bailout. Most Western countries manufacturing has shrunk due to cheaper labour in the east. The fatties would be healthier if they had to bike it. It’s great fun: swearing to yourself as you grit your teeth pushing into an east wind with horizontal rain……. And to think this country ruled a good part of the world at one time. What a mess. Yes then the Tories decided to replace real engineering with financial engineering, deregulated its finance sector, glorified greed, trampled the social contract into the dust and let loose the spiv speculator to go about his/her sociopathic business- and the rest is history. USA – exactly the same. With more war and violence. It is as I have said. Now that the privileged no longer have an empire to plunder they have turned their attention inwards and gnaw at England itself. One might have thought the £44 trillion they extracted from India might have been enough, or the centuries of wealth pillaged from Irelands, Wales, and Scotland. But no. And most of Britain’s wealth isn’t even in Britain. It’s in the Bahamas, and Monaco, and Switzerland, and Andorra, hidden behind layers of corporate ownership. And still they must increase the returns on their money, for it is never enough, and damn the costs and the carnage. We see that is the model for the rest of the world as well, and it can only end in tears, but it will end, when there is nothing left to steal. I am a UK citizen and live 50% in Thailand now. I bought in Thailand a new Toyota diesel pick up last year because I still believe for a truck, diesel is the most reliable, cheapest cost and convienient fuel for running a vehicle for a while, especially in Asia. Electric vehicles appear to be being forces on people by western governments as CO2 emission taxes were on petrol 15 years ago and hence people went to diesel. I don’t understand the reference to “battery-electric vehicles and plug-in hybrid electric vehicles”. I thought that all pure-electric vehicles require plug-in, and that hybrid electric are charged from a supplementary gasoline engine rather than from the grid.